The new San Francisco-Oakland Bridge has opened to traffic, 24 years after the old bridge broke on October 17, 1989 at 5:04 p.m. With that, it might seem like a great weight has been lifted off our collective shoulders and we can put the Loma Prieta earthquake behind us. Can we finally say that the Loma Prieta earthquake is over? I would say no more than the 1906 San Francisco earthquake is over. What kind of event is an earthquake, anyway? To us, it's a great interruption, to be gotten over as quickly as possible. Earthquake victims long for closure, sometimes desperately. After 1906, the movers and shakers of San Francisco worked feverishly to erase the evidence, from deliberately underestimating the number of deaths to opposing updated building codes. The 1989 quake brought out an echo from that earlier time when the Marina district, with its homes built on rubble from 1906, suffered the worst damage in the city. The idea of a century ago that we had things under control was an illusion. If we perform a strenuous philosophical exercise and imagine instead how nature might regard an earthquake, we probably would call earthquakes a step forward. They release stress and allow the landscape to proceed with its life-cycle as the tectonic plates progress in theirs. Earthquakes rejuvenate the landscape's structure, maintaining our mountains and basins over geologic time. That Olympian glimpse of things is one of the comforts of science, but it doesn't help the human situation any more than talk of remote ice-age cycles excuses the reality of global warming. Science does tell us a few things about earthquakes, some more meaningful than others. 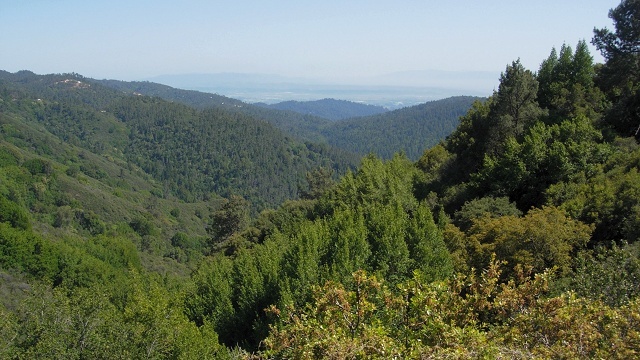 The epicenter of the Loma Prieta earthquake is shown on the map of Forest of Nisene Marks State Park. People go there to stand on the spot. But it has no physical meaning whatsoever; it's merely the spot on the Earth's surface that lies directly over the center of the deeply buried rupture. We look for definitions as eagerly as we hunt down that epicenter, even though they're artificial things with an uncertain relation to reality. When is an earthquake over? By seismological convention, it's when the aftershocks of the event decline to background level. The concept is based on arbitrary definitions, but there is mathematics that matches it (one of the ever-fresh joys of science). However, consider that many aftershocks have their own sets of aftershocks. Then consider things at a larger scale: What if even 1906-size quakes are part of a bigger cycle, aftershocks—or worse, foreshocks—of some colossally greater one? Seismologists didn't think that way in the past, but history since 1989 has pushed open the door to that disquieting idea. The giant earthquakes in Sumatra in 2004 and Japan in 2011 were that kind of event, and some theorists have begun to argue that the San Andreas fault, too, could rupture at a larger scale than we've witnessed in our short recorded history here. If science can't assure us that Loma Prieta is over, neither can the completion of the new Bay Bridge. After all, we still have vacant buildings, in downtown Oakland and elsewhere, left over from that day. We still have a steady stream of money going into retrofitting and strengthening infrastructure, like freeway overpasses and water mains and school buildings. Someday, we can imagine, everything will be finished, but the U.S. Geological Survey's current estimate is that Northern California has a 2-in-3 chance of another Loma Prieta–sized quake in the next 30 years. For long-time residents, Loma Prieta will never end. Speaking for myself, a certain slant of light in October and postseason baseball, especially when it involves Bay Area teams, are sure-fire triggers of the memories. As I ride BART into the West Oakland station, I still get occasional flashbacks of the smoldering remains of the Cypress Structure where Mandela Parkway runs today. Loma Prieta will linger in our collective memory for many years to come, and that's a good thing. Life in California should be considered a permanent state of earthquake. Another ongoing legacy of Loma Prieta is a good one. In the weeks after the 1989 quake, the USGS's Bill Bakun designed and deployed the first automatic earthquake alarm. It was a set of seismometers near the epicenter, hooked up to a radio. When the seismometers detected a significant aftershock, the radio alerted demolition workers in Oakland, giving them a good 20 seconds to back away from the wreckage before the shaking arrived. In the generation since then, earthquake warning systems have been put into operation in Mexico, Japan, Turkey and elsewhere. Just last month, a new law went into effect committing California to "develop a comprehensive statewide earthquake early warning system." Let's hope it happens faster than 24 years.